American leadership in the world is important, wldnja. 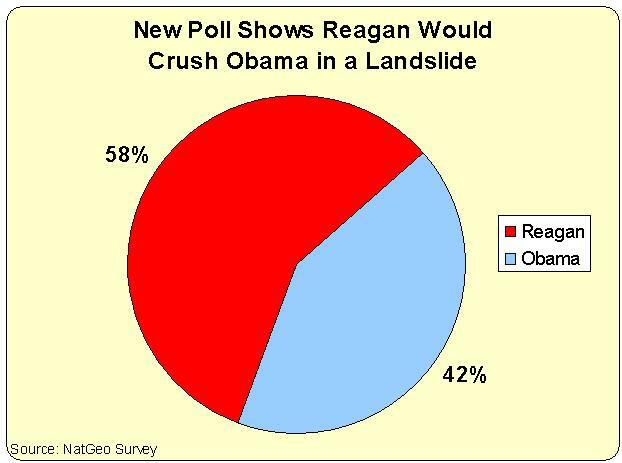 However, my point is that when hypotheticals are in play and “even the young would vote for Reagan (despite presumed hostility to him in textbooks and teaching – something I’m completely unaware of given the general favorable public sentiment toward him and every subsequent President’s acknowledgement of him),” I find the election exercise to be of little value. If we want to measure presidents say by their ability to bring the deficit down in the past 60 years, Clinton ranks first, Obama second. If we are in a tither about North Korea, Iran or any host of potential nuclear nut jobs, they know enough to understand that U.S. military technology, prowess and capabilities will squish them like a bug. So, given that our military’s annual expenditures exceed that of China, Russia, Japan, India, England, France and Germany COMBINED, why again are we focused on Reagan v Obama? I am not, nor ever have been an Obama or Reagan acolyte – the president is elected as one of us. I have respect for everyone who’s held the office regardless of decisions made fitting my view of what should be done. I find exercises like this wistful nostalgia. The U.S. economy and government are the result of years of incremental change playing off the needs of one group v. another, as is the case in pluralistic society. Reagan had some wins and losses in an era when common purpose in Congress could be found. Basically, it’s been 20 years of “up yours” regardless of which party runs it. I have to say that Obama’s presidency faces a considerably more truculent mindset. Consider the Senate majority leader’s comments not long after Obama was inaugurated in 2009. – “Our fist order of business is to get rid of Barack Obama.” Gee how transformative can one be in that environment? First of all, who CARES about this? Secondly, the past always SEEMS like a better place and Reagan rode that into office with the ’50s which the popular culture of the 1980s embraced in its imitative form. In both of those decades there was PLENTY that was not safe and ominous. I guess some people have too much time on their hands. You might as well put Washington, Lincoln, the two Roosevelt’s and Clinton in for good measure to figure out who runs home with the mythical presidential wins trophy. . .